During a pregnancy, there are a lot of changes that occur with the body. The goal for all pregnancies is to provide the perfect environment for a baby to develop and grow healthy. For the expectant mother, you may be dealing with pain throughout your pregnancy because of the drastic changes that your body is going through. The good news is that there are ways to experience relief naturally during your pregnancy. If you are in the St. Paul, MN area, our team at Caron Chiropractic Clinic, P.A., specializes in chiropractic treatment for individuals going through a painful pregnancy. Setting up a consultation with our staff should be your first step! Often times, the spine can become misaligned during a pregnancy because of all of the changes that occur with the body. The abdomen is extended, back posture is weakened, the uterus expands and weight is gained. These changes put a lot of pressure on the spine, causing it to become misaligned at times. Also, the pelvis can become misaligned, which has a direct impact on the amount of room your child has to develop. Through chiropractic care, our dedicated staff focuses on getting your spine back into proper alignment naturally, which in turn has a positive impact on the overall body. Focused chiropractic manipulations and adjustments will help provide you with natural pain relief during a pregnancy. Pain relief is only one of the ways that chiropractic care can help during a pregnancy. Chiropractic care can help patients ensure that they are having a healthy pregnancy throughout the entire process. For those dealing with nausea, chiropractic care can help control vomiting. In regards to the delivery, research has shown that chiropractic services can boost the chances of a full-term birth and can reduce the length of your actual labor and delivery. If you are aiming to prevent a cesarean section or vaginal breech delivery, chiropractic care is something to consider. As an expectant mother, you have a lot going on both physically and emotionally during a pregnancy. At Caron Chiropractic Clinic, P.A., we love helping pregnant mothers achieve natural pain relief and other benefits during their pregnancy. 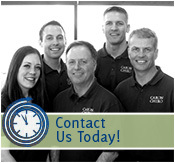 If you are in the St. Paul, MN area, give us a call today at (651) 255-9999 to set up a consultation with one of our chiropractors. This is a partnership during your pregnancy that you surely will not regret. This entry was posted	on Wednesday, January 17th, 2018 at 2:15 pm	and is filed under Chiropractic, Chiropractic Treatments, Chiropractor, Infants, Pregnancy. You can follow any responses to this entry through the RSS 2.0 feed. You can leave a response, or trackback from your own site.